Redshirted during his sophomore season. Appeared in eight games, one in conference play … Threw 10.1 innings and struck out 10 batters, while allowing just six earned runs and three walks … Worked a season-high 5.2 innings in his lone conference appearance (vs. Auburn – April 21), striking out a season-high five batters, and throwing 79 pitches … Didn’t give up a run in his first six appearances … Made his collegiate debut against Bryant (Feb. 25). Ranked as the No. 489 right-handed pitcher and a top 1000 recruit in the nation according to Perfect Game … Ranked the top right-handed pitcher and the No. 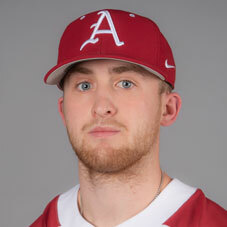 8 overall recruit in the state of Arkansas … Named 2016 Rawlings-Perfect Game Southeast All-Region honorable mention … Earned all-state honors … Went 7-1 with a 0.46 earned run average in 2016 … Recorded 92 strikeouts compared to nine walks in 46.0 innings pitched … Also hit .442 with eight doubles, seven triples, and was a perfect 13-for-13 in stolen base attempts in 2016 … Struck out 96 batters in 51.0 innings and posted a 0.41 earned run average in 2015 … Played summer ball for the Diamonds Baseball Club … Pitched seven scoreless innings for Diamonds Baseball Club at the prestigious East Cobb Invitational in 2015 … Played for head coach Mark Crafton at Beebe High School … Also played for the Midland Redskins and played in the Connie Mack World Series. Son of Manley and Leah Ann Denton … Has one sister, Anna, and one brother, Levi … Brother, Levi, played baseball at Harding University … Plans to major in recreation and sport management.